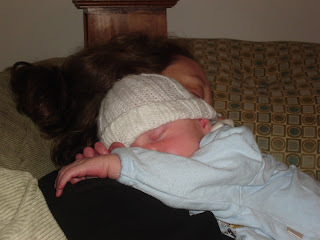 This picture serves as a disclaimer that, while the time leading up to Linus' birth and his birth itself were the hardest things I've had to go through so far in my 32 years of life, I know now (and I knew at the moment this picture was taken, and even before) that it was, indeed, all worth it. It also made me more aware of Jesus' suffering on our behalf, since I know that what I went through was can't compare in the least. My intent in these posts is to share what I struggled through and what I've struggled with over the last year; not to complain. So, to pick up where we left off, I lived life for three weeks, on edge, wondering if I would start to bleed, doing research, talking about my problem to anyone that would listen, and taking it easy; which meant I watched my house get dirtier and dirtier. I returned to the perinatologist who said I was still a complete placenta previa and that, since I hadn't started bleeding, I could just keep on doing (or not doing, I suppose) what I was doing. He also said that I still didn't look like a placenta accreta. I was to return in three more weeks, on Wednesday, August 8th, to check the placenta again. That appointment, as it turns out, would have to be canceled. Because of my travel restriction, I wasn't able to go to my nephew's 16th birthday party, about an hour and a half away from home. I wasn't able to visit my grandparents, who lived an hour away and who both passed away this past Christmastime. I wasn't able to go on my family's every-other-year vacation to Canaan Valley, West Virginia. Duncan's mom didn't like that I'd "be alone" (my parents, who live 3.2 miles away, would be on the WV vacation) the first week in August. She insisted on coming and staying with us. We told her we'd rather wait until we needed her if I were to go on bed rest. She pushed and we relented. She arrived on Friday, August 3rd. In hindsight, her heart clearly was being prompted by the Holy Spirit, and we're so thankful for her obedience. On Saturday, Duncan helped some friends move in the morning and in the afternoon, I visited a friend who'd just had a baby at the hospital. I had a c-section date of September 18th, so I marveled that soon, it'd be my turn. On Sunday, we went to church. On Monday, August 6th, Stephanie and I made a meal plan and a shopping list. She was going to make a bunch of meals to put in our freezer for when the baby arrived. We went shopping at BJs and, while there, I felt like I'd overdone it. We went home, got the girls down for nap/rest, and I slept and relaxed. After dinner, Duncan and I went on a "date" to a few new stores in Bowie. I got home, was doing something on the computer, and I felt it. I didn't say anything, but I went to the bathroom to confirm my fear, and saw that it was realized. I had started bleeding. Because Duncan's mom was sitting on the sofa in our living room, we were able to be out of the house in less than a minute. We called the doctor and the hospital on the way, got to L and D, and were put into triage. I remember thinking about having a baby at 33 weeks. I remember worrying when the nurse couldn't find the baby's heartbeat. Which I would come to realize wasn't unusual, since I had to be monitored for 30 minutes 3 times a day while I was in the hospital. I remember wondering where my doctor was. I learned that doctors see their long-term patients about 15 seconds a day and give most of their care through the nurses and the internet. I don't remember dreading being on bed rest, in the hospital, for 23 days. But I entered a room and would not leave its four walls for 10 days, when I was granted wheelchair ride privileges. And that I wouldn't leave the hospital for 27 days. And that my baby wouldn't go home for 30 days. I won't recount all of the details of the hospital stay. Feel free to go into my archives of August 2007 and relive those gory details. The most heart-wrenching part was to only see my girls for about an hour a day. But, I tried to focus on the fact that my dear, sweet husband made sure that I saw them every day. I also saw Duncan at least once every day, except for one. Once we had a new c-section date, it was just about all I could focus on. Little did I know, that the struggles wouldn't end on that date, but would continue. They would continue to the point that I didn't think I could take anymore. Since the tears are starting and it's very late, it's quitting time. Silly Saturday: Megan and "Champ"